In this plateau, I would like to redirect the many discussions of the experimental visual elements of Eikon Basilike by viewing these visual disruptions, first and foremost, as a kind of joyful proclamation rather than as violence or a reflection of violence as they are typically understood. While Eikon Basilike is ostensibly a poetic discussion of Charles I’s regicide, and in particular his decapitation, I would like to argue here that these violent images have tended to distract critics from what is necessarily a moment of both disruption and exclamation. Much to my surprise, despite the literature surrounding Eikon Basilike focusing on violence, disruption, and negation in the text, scholars of Howe’s work often use terms of pleasure or positivity, usually unqualified or in passing, to describe these moments of overwhelming. Consider, for example, Kathleen Crown’s note on Howe’s work as “ecstasy” (488). For Crown, while she does not pursue this line of argument, Eikon functions as ecstatic insofar as it works to move outside of or beyond the gridlines of a clearly delineated (literally in print as well as metaphorically) systems of logic, history, and legality. Craig Dworkin, in his chapter on Howe in Reading the Illegible, also makes joking use of the term ecstasy in reference to her visual disruptions, arguing that “[w]ith an ear attuned to the pleasures of noise, Howe writes from out of the static; ex-static indeed” (47). Dworkin throws out “ex-static” almost unthinkingly, but I believe that the term is certainly worth pursuing in terms of Howe’s work; “ex-static,” in my work, becomes a way of designating the radical potentials of joyful movement, at once out of the static, the stasis of grid and structure, as well as a communication coming out of static, or noise. In Eikon Basilike, Susan Howe is stuck between stations. My use of “ecstasy” here, as well as Dworkin’s and Crowns, should recall my use of the term earlier in my discussions of Jackson Mac Low wherein, for the poet, ecstasy, or ekstasis, functions primarily to transport both writer and reader, to move him or her beyond the typical confines of his or her identity. In this sense, we must begin a discussion of the ex-static in Howe as one grounded in the disruption of monadic identity. Crown herself gestures toward this in her use of “ecstatic” which she uses to designate one element of Howe’s challenge to a linear view of history and its complicity with the supposed unity of the lyric subject (488). While she does not explicitly make this connection herself, Crown’s designation of Howe’s ecstatic is inherently tied to her analysis, a few pages later, of Howe’s language as a “stutter” (501), as in the expositional stuttering I discuss in Juliana Spahr’s work. Both ecstasy and stutter function as the “anti-telos” of Howe’s work (486), which Crown foregrounds. But, Crown’s analysis asserts, at its core, that these moments of anti-telos, of stutter and ecstasy, function as inarticulation or noise that serve to overwhelm rhetoric with what she terms the somatic force of language (499). While the French feminists maintained the ecstatic or joyful aspects of a somatic linguistics, in Eikon Basilike this overwhelming somatic returns our gaze to the violence of colonialism, of regicide, and of the silencing of minor voices. And, certainly, there is something radical and important about aligning these forms of violence together. But, my work is interested in a politics of noise that is not particularly concerned with the body (linguistic or otherwise) and rather with something quite external to the physical. I will return in later plateaus to the importance of embodiment and the somatic force of language; here I am primarily concerned with those moments when Eikon Basilike gets exstatic and moves away from these structures. As Dworkin’s theorizations of poetic noise in Howe’s work tell us, while a poetics of noise is necessarily a poetics of disruption and of breaking-apart, it would be a misstep to suggest that a poetics of noise is thus an attempt to mimetically reproduce these disruptions. Rather, a poetics of noise is primarily concerned with carrying out this disruption itself; noise poetry is a speech act. In Dworkin’s words, noise has the potential in and of itself to disrupt, and it is “[t]his potential to disrupt the message, to unsettle the code of the status quo [that] makes noise more than simply the record of violence” (39). Rather than merely serving a communicative function, as I have indicated elsewhere, a poetics of “noise proliferates hand in hand with an increase in the terms of communication” (45). And, again as I have discussed in the link above, treating noise as representative or communicative—that is, reading it as hermeneutics, as the scholarship surrounding Howe (my own work included) tends to—jeopardizes the disruptive potentials of noise. Dworkin reminds us: “[e]ven critical scholarly work that pays close attention to the disruptive possibilities of visual prosody runs the risk of neutralizing the very disruptive potential it identifies” (49). By characterizing Howe’s noise poetics as “visual prosody,” Dworkin foregrounds the material and physical aspects of poetry, which I will return to in my fourth plateau on embodiment. What I do want to mention about this physicality now is that, in recalling Crown’s emphasis on the somatic force of language, Dworkin’s interest (following Howe’s) in “poetry as a physical act” (31) tends to similarly limit the radical potentials of noise. That is, in arguing that her abuses of language echo the historical dangers and violences of language (38), ultimately confronting “the illusion of the transparency of the printed page” (41), Dworkin’s work reifies the static, grounding what is essentially ephemeral into the limitations of the material text. Even if through her own emphasis in her poetics (namely in the wildly popular and frequently discussed My Emily Dickinson) on the material conditions of the grapheme, “Howe reinvigorates a consideration of the material conditions of poetry” (43), the anti-telos of Eikon Basilike, and the spectral remainders that permeate the text suggest that a good deal is happening in the literal intersections of these lines than a foregrounding of physicality. Certainly Dworkin makes an important point in his argument that “[t]he material text cannot ever completely escape from the republic of signification; it simply crosses the border from the canton on ‘literary’ to that of ‘visual’ art” (48). But, I cannot help but wonder if this line of argument does not simply follow Plato, ultimately denigrating the written word in the way that Derrida famously opposed. Here Gerald Bruns seems to speak my own oppositions to Dworkin without ever naming him explicitly. Bruns, too, associates Howe’s semantically nonsensical work with “noise” (36), but in doing so he maintains that we cannot focus too much on the “grid” and Howe’s visual disruptions of it because that would ignore the important aural elements of this disruption. Seemingly reversing the Platonic scepticism of the mimesis of the grapheme, Bruns positions the aural as anarchic where the visual is not. For this reason, he calls Howe’s work, her visual prosody, “anarchic sound-forms” (37-38). While Bruns’s focus in his article is on Howe’s later work, I would like to use this conception of the anarchic sound-form to illuminate the fact that in Eikon Basilike so many of the visual illegibilities are actually based on aural connection or misleading rather than purely visual ones. Collapsing the divide between aural and written, Howe’s project is inherently postanarchist and thus interested in seeing these discontinuities as both aural and written, and all the more radical for it. And, in this way, I take up Paul Naylor’s terminology in his discussions of Howe’s work as intervention (67), much in the same way I characterized Robert Duncan’s, save that in the case of Howe, these interventions are located in the intersection of aural and visual. We can categorize Howe’s visual/aural interventions into three loose and necessarily interconnected categories: anti-regulatory, anti-assurance, and anti-logic (all inherently linked to the anti-telos that Crown signals in her discussion of iconoclasm). They all speak out of static, and intervene in stasis. Howe’s work as anarchic is concerned, in so many ways, with a disruption of the regulatory potentials of language. Rather than simply imagining language as regulating categorical or linguistic constructions, Howe’s work positions language’s regulatory function as upholding the larger oppressive structures of government and property. As Naylor observes, “regulating nature’s representation in language with the tools of grammar and spelling keeps the lines of ownership and mastery well defined and open to adjudication by the ‘European grid’ of property-rights law” (55-56). In Eikon Basilike, these anti-regulatory interventions surface in the form of visual illegibilities or overlaps that work to dismantle the emblems of government and law. For example, on page fifty-four[i] the words “misapplying Law” in a vertical line intersect with “misprison” and a “now nonexistent dramatic personae.” Here, Howe identifies not only the potential for those in power to manipulate repressive state apparati (Law, prison) for the purpose of stifling opposition. But, in their intersection, the misapplication and the capitalized Law are brought together with a “dramatis personae,” the spectral actors in the scene of Eikon Basilike. As these two “confront each / other,” Howe’s illegibility brings to the fore the radical potentials of language to counteract these abuses. A few pages later, the terms of the repressive state apparatus begin to disintegrate, as in the “s t e p s” towards execution from the “p r i s o n s” in which antigovernmental voice (here paradoxically represented by Charles I) slowly fall apart (56/57). Appearing on two pages that are reversed versions of each other, Howe separates the letters of these terms to reveal the erasure carried out by each, to encourage their confrontation. Both pages feature at their centre “A p i v o t” (56/57). 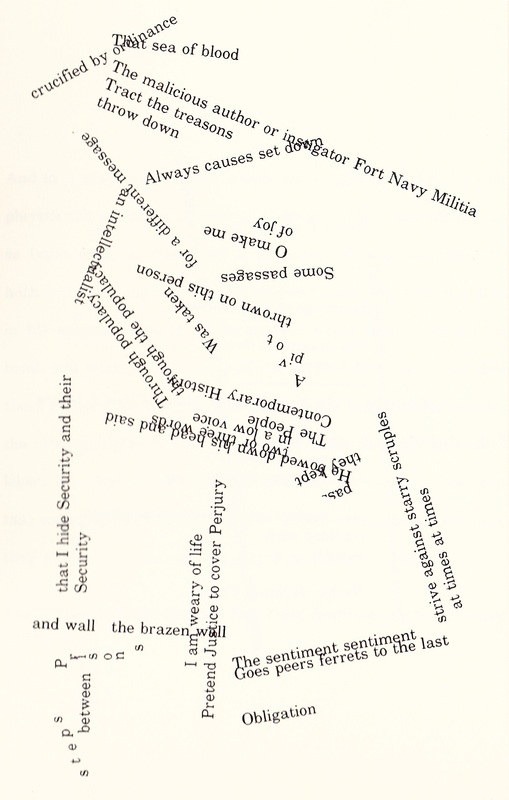 Later in the serial poem, when the visual disruptions become even more pronounced, these emblems of government repression and legality become even more illegible. On page seventy-three, the designations of illegality fall apart: upside-down and segemented, “a u l t e r e r” perhaps recalls “adulterer”; “P e r e r i a t i o n s” perhaps recalls “perpetrations.” Both visually compromised and aurally disrupted, these terms contain only a trace of repression. On page seventy-eight, the “cudgel”—so often a symbol of self-defence or rebellion—obscures the “dgnnre of Rebellion,” and suddenly the repressive apparati of opposition are brought into question, too. “Dgnnre,” itself semantic nonsense, recalls both visually and aurally a “danger,” but what is more interesting is that the interference of the word “cudgel” superimposed on it makes the double “n” and the “r” look distinctly like an “m,” dramatically altering the aurality of the term, and recalling the word “dogma.” Rebellion, in its capitalization and its cudgelling violence, is rendered dogmatic, too, aligned with the grid-like regulation of the government and its regicide. Naylor suggests throughout his chapter on Howe that her disruptions are all marked by a lack of what he terms “assurance” (61), or the comfort inherent in the encoding and decoding of a message received in Jakobsonian fashion. Assurance, in this case, is the mark of the unity of the lyric subject, the cohesion and trustworthiness of the lyric voice. Obviously, Eikon Basilike refuses to provide its readers with such a lyric, in her own work or in the works from which she borrows. The complex of authorship is made manifest in some moments of illegibility when the assurance of the lyric voice is made impossible by the visual and aural complications of the text. One excellent example of this is on page fifty-eight, wherein the already experimental conception (owing no small debt to the Black Mountain poets) of the “Historiography of open fields” is superimposed by the upside-down signature, “Signed King in profile.” The already half-faced (that is, profiled) King who supposedly authored the “original” text in question is further complicated through reversal and palimpsest. Even more puzzling is the inclusion of a capitalized W just above the upside-down line, which this author makes no attempt to decipher. And this inability to decipher is pre-empted by Howe, too, in the following page where the line, “An intellectualist out of levelling love” (59), is superimposed diagonally over a prose-like paragraph. So, the historical facts here are already unclear, like the “Tuesday Jan. 30” with the “H T writings” on top, made really illegible (59). But my desire as “intellectualist” to decipher the text is met with the levelling (or destabilizing) force of “love.” Toward’s the poem’s end, the lines “in the ace of speechstone / Spelling surname” (76) criss-cross to remind us that this assurance is withheld as a result of an impossible monadic identity[ii]. And just a page later the words “ithuriel intent” (77) are presented as connecting in an artificial centre by their “i”s. Here Howe not only foregrounds the artificiality of connecting an “author” with his or her “intent,” an old-hat observation by now, but she also suggests that authorial is really ethereal, the placing of the “I” into the ether. To conclude then, as she herself suggests throughout Birth-Mark, a collection of poetics essays, Howe’s project is one of “unsettling” history. As Naylor goes on to explain, “Howe’s poetry seeks out a different logic, a logic she believes has been repressed rather than assured by the centuries” (61). It is this anti-logic that Crown identifies in her stuttering, that Dworkin sees in her noise, and that Peter Nicholls sees in her “stammering” which he argues “keeps us on the verge of intelligibility, [where an] emphasis on sound is coupled with a habitual shattering of language into bits and pieces” (597). So, in the epigraphic poem I mention in my last plateau, the word “beering” (already upside down) contains about it the letter “a” hovering over the second “e.” The word “beering” is itself extremely archaic, recalled, according to the Oxford English Dictionary, a buzzing, noisy sound (birr) as well as a very contemporary colloquial referencing to consuming alcohol, especially socially. On the other hand, “bearing” suggests both a relevance or meaning and a movement or direction. The two collide into one unpronounceable, unwritable word that refuses logical semantic inclusion. This anti-logic is brought together with the themes of violence and authorship in the final page of the poem, where a disassembled “s h i e l” instructs us to remove the “s h i e l d” from “T s h h r i e e a l d d” (a nonce “word” than I cannot help but read as “threshold”). Once the shield, the defensive posturing is removed, we are left with “t h r e a d,” a recollection of the various images of Ariadne/Arachne and the woven tale throughout. The risks disconnecting completely at its close: “t r a c e” works its disassembled way upwards, “w e f t” barely holds on in the bottom-right corner. The “bearing” that is signalled in the epigraph is disintegrated by the poem’s end, and we are left instead with the anti-logic of trace and weft, the spectral presence of meaning, the ecstacy of static noise between the lines of the grid. [i]Because the pages of the original edition of Eikon Basilike are not numbered, all numerical designations from the long poem are references to the 1993 appearance of the poem in The Nonconformist’s Memorial. Any differentiation between editions will be noted via footnote. [ii]It should be noted that in Eikon’s original edition, these two crossed-over lines are given their own page to emphasize their importance. In The Nonconformist’s Memorial they are relegated to the bottom of the page that comes before. This is a really successful plateau, I’d say. I love your definition of “exstatic,” which is really productive! I think you tend to move away from explicitly dealing with exstatic/aural/noise as the plateau moves into the three “anti” chambers (apologies–I couldn’t resist). Could you tie those section more directly to the discussion that precedes them (I think a sentence here or there explaining the ideas in terms of exstatic/aural/noise elements should be fine). I like your suggestions for Howe’s nonce words “pererations” et al. I think, though, that you might extend your suggestions further: “pererations,” to me, suggests “peregrations,” (the OED lists “pererration” as an obsolete word with similar meaning) and possibly “perforations.” Likewise, “aulterer” suggests variations on “aul” (“all”) or “awl,” as well as alterer/altarer (one who alters/altars). I just think that offering multiple suggestions for possible meanings maintains the destabilizing nature of Howe’s work, which you nicely emphasize in your discussion. Finally, are you avoiding using scans of the pages because you don’t want to worry about copyright? That’s probably reasonable for the blog–but I think you should strongly consider reproducing the original page/image for the page-bound version of your diss! *phew* You finally like something! I feel better now. I know I drop the aural stuff in the middle — I was just so worried about how long this plateau was getting. But, you’re correct. I do need to pick it up again. Re: your suggestion of pointing to multiple readings (which I would have a field day with, you and I both know! ), do you think that would be best incorporated into the paragraph itself, or put in a note? I like the idea of pointing to the multiple here, but I also don’t want to lose the political thrust of the reading’s I’ve included. Re: scans. On the blog itself I don’t think I’d get into any trouble including a scan or two. I did it with Cage. I’ll plug a few in where the visual is most important. I do have a question, though: in some cases I refer to specific words in a larger visually disrupted page. Would you recommend zooming in and maybe clearing out some of the stuff I’m not discussing? Or, should I include whole pages no matter what I’m discussing? A footnote would probably work well to avoid diverting attention away from the political. I think that’s what I’d recommend. As for scans, why not do both (include the entire page/area and a “detail” of the specific word/element)? I think showing the relationship between the element and the field is important, as is emphasizing the element itself. So, if it’s not too difficult, I’d vote for both. Okay. I’ve gone through and added a few scans where I feel they are necessary. I’ve used the first edition of the text, half because the print is larger, and half because I’ve completely written all over my copy of _The Nonconformist’s Memorial_. Let me know if there are scans you would like to see added.